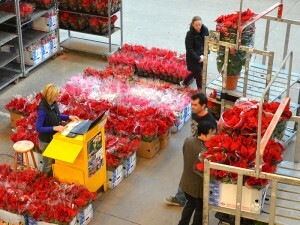 The red intense of the ponsetia goes days flooding the lounge of direct sales hall of the Mercat de Flor. 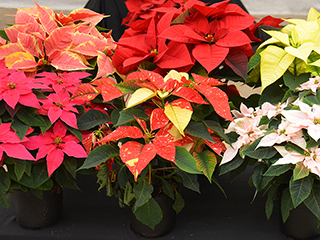 The most common plant of Christmas offers this year the highest quality to its buyers, fruit of a benevolent autumn that has guaranteed its good morphologic and sanitary condition. The traditional ponsetia, the red one, represents more than 80% of the product that is demanded these days, and it is possible to find in different presentations and measures, in pots of 7,5 Ø, 10,5 Ø, 12 Ø, 14 Ø, arbustive or as tree-top. On the other side, there is a wide range of ponsetia in multiple colors: white, yellow, pink, mottled, fuchsia… in its habitual formats of 12 Ø, 14 Ø. 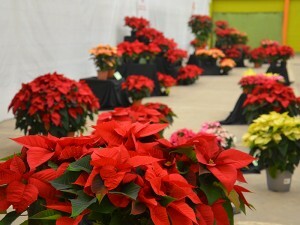 The princettia also consolidates its space among the plants of Christmas season and relies on the Mercat different formats and colors. The ponsetia and princetia that go out to the sale in the Mercat these days it’s for the most part of Km 0, elaborated overcoat in the region of the Maresme. Due to being a delicate plant that suffers very much with the transport in long trips, only a small part – correspondent to the mini formats – comes from Holland, and another small part rises of the region of Almeria.